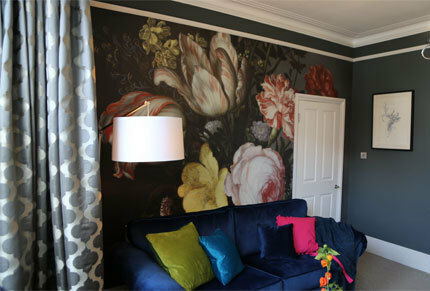 Did you spot Surface View’s wallpaper mural on Sarah Beeny’s ‘Renovate Don’t Relocate’? Property developer and TV presenter, Sarah Beeny’s new show ‘Renovate Don’t Relate’ encourages home owners to make their properties work harder for them rather than the costly process of finding a new home. In the episode 4 Christopher and Edel's home was renovated to accommodate their growing family. With the family’s crowded kitchen being used as a multi purpose playroom come study come kitchen, the room was overworked with the other areas of the house being used for mere sections throughout the day. With some simple re planning of the home, Chris and Edel created a separate office area with separators. In the living room Christopher and Edel focused their efforts on creating a grown up space for them to unwind in after a long day. Selecting our National Gallery Mural ‘Flowers in a Vase with Shells and Insects’ they blew up the stunning Dutch Still Life painting to go full width across the wall. Painted by Dutch Golden Age artist Balthasar Van Der Ast, a pioneer in his field, this stunning painting was created back in 1630. 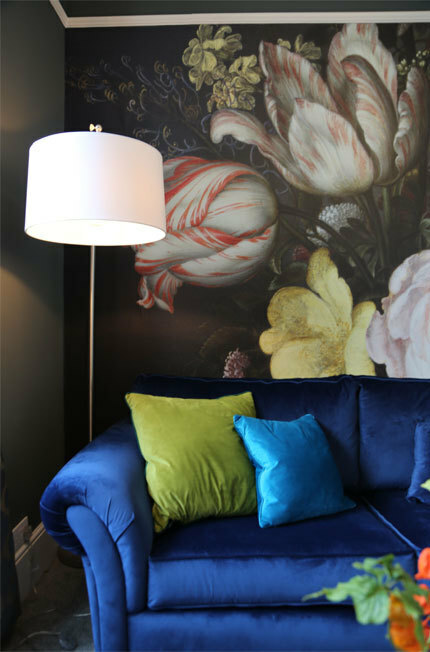 Using state of the art printers, the original artwork has been transformed into a bespoke wallpaper mural. Produced made to measure, the mural has no waste and is installed in panels allowing you to match the sections for a seamless finish. Did you watch the show? Would redesigning your space encourage you to stay in your current home or would you rather relocate? Let us know in the comments, we’d love to hear!